I ran into a photo of Multnomah Falls on Pinterest maybe seven or eight years ago. I immediately Googled it and planted it in my brain. At that moment, I remember thinking, "I'm going to see that one day." Almost a decade later, I made it happen. But what I didn't know at the time is that Multnomah isn't some one-off watery oasis an hour east of the hipster capital of the world. The Historic Columbia River Highway, which it sits on, is one of the prettiest drives in the country (it was the first planned scenic drive in the US for a reason). Doing it justice takes at least an afternoon, and there's a ton of spots to check out — not just Multnomah. But we'll get to this drive and its hot spots in a bit — let's get the big guns out of the way first. There are two things no one can prepare you for when it comes to Multnomah — its size and its popularity. 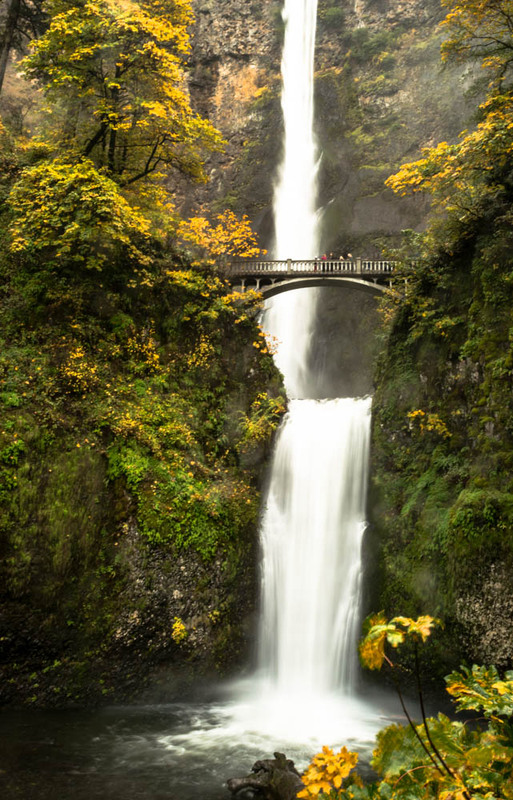 Looking at Multnomah Falls is like trying to view the Empire State Building from its sidewalk. It's so close to the road that taking it all in is almost easier from the car — all the more proof how stunning this highway is, but more on that later. You park in the lot right in front of the falls, wind your way up a sidewalk to the right (behind the gift shop, because America), and that takes you to the famous bridge. From there, you can decide if you want to cross it and hike all the way to the top. People. Will. Be. Everywhere. Parking will not be good. Because of this, go early in the morning or late in the afternoon, if at all possible (preferably early in the morning to get in your hike to the top). Everywhere will be busy — not just the base. That being said, don't let this discourage you. The photography you've seen isn't misleading; this place is incredible. You can also just make the short walk up to the bridge and take it all in from there. If you're with someone who can't make the hike up, this is still a stellar, jaw-dropping option. You'll probably get a little shower, too. For serious hikers (or those with more time): The Multnomah-Wakeena Loop is 4.9 miles long, moderately difficult, and begins and ends in the Multnomah parking lot. It's best to go counter-clockwise toward Wakeena first — from the parking lot, walk past the visitor center/gift shop and you'll see a sign for Return Trail #442 toward the west end of the lot. Take this and you're off! 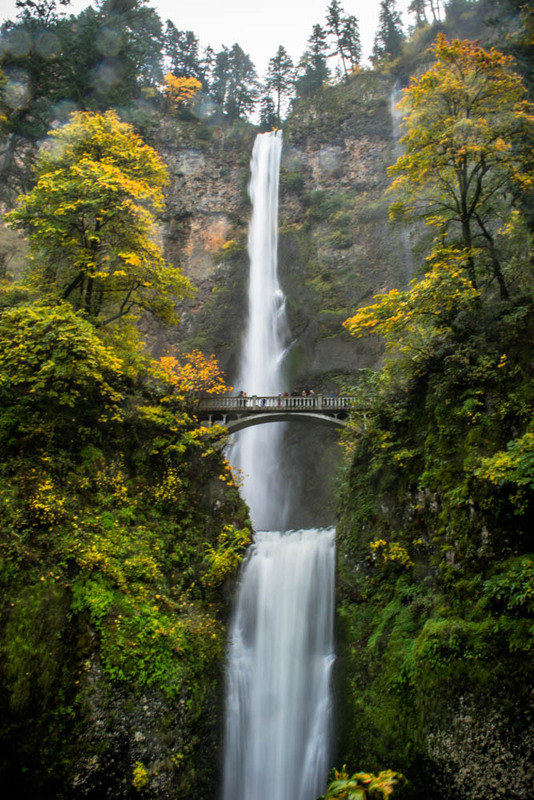 On this trek, you'll see four other falls, in addition to Multnomah from different (and sometimes better) angles. Multnomah Falls is a fantastic experience, but "the whole is greater than the sum of its parts" and all. If you visit, try to have an entire afternoon/day to drive along the Historic Columbia River Highway — there are so many waterfalls and beautiful spots that eventually you'll be unimpressed. The road's directly east of Portland and goes for just under 75 miles — I typed in "Corbett Country Market" into my GPS (it's right on the highway) and just drove east from there. Portland Women’s Forum State Scenic Viewpoint. I couldn't really tell you what this looks like as when I was here, the fog was so heavy you could barely see two feet in front of your face. From what I can tell, it's a five-minute stop. Vista House at Crown Point. This one will take you a while. It's beautiful, and you'll get 360-degree views of the awesomeness. Latourell Falls. This will be the first waterfall you'll encounter that makes you realize, "Ohmigod...ohmigod. I didn't even prepare myself for this level of an experience. OHMIGOD." A quick 10-minute hike will get you to the view in the below photo (nope, not a painting), though you can hike further as well. Sheppard's Dell Falls. Full disclosure: I didn't stop, and the below isn't my photo. I wish I would've though, because this bridge is dope. The falls is below and to the left, coming in at 220 ft. Bridal Veil Falls. The third waterfall along your drive, and by now you're starting to get it. Pardon my lack of a tripod for the below photo. How do people seriously bother carrying one of those things while hiking? I need to care more. Also, the below view is pretty much right off the road — very little hiking involved. Wahkeena Falls. There's a .2-mile hike to the bridge that goes over the main part of the falls, but as discussed before, you can keep going all the way to Multnomah. It's 1.4 miles to the top of Wahkeena, and apparently there are good views of the gorge throughout. I say apparently because I didn't give this one the time it deserves — can you tell I was rushing? I had NO IDEA I would want to stay so long in this area and didn't block off the correct amount of time. And after Wahkeena, you hit the grandaddy of 'em all, Multnomah. And after that, there's Horsetail Falls, Ponytail Falls, Oneonta Falls, Upper Oneonta Falls and Triple Falls (remember how I told you you'd get sick of waterfalls?) — you can see these by hopping on the Horsetail Falls trail. It's 4 miles long, and you can bet it's on my bucket list to do next time. If you're anything like me, the question constantly going through your head is, "HOW DOES ONE PLACE GET SO BEAUTIFUL?" Let me break it to you: The answer is almost always plate tectonics. The slightly longer answer is that the gorge was carved by the Columbia River during the Cascades' uplift. When the Missoula floods happened (yep, Missoula used to be a lake), everything was water (EVERYTHING) and erosion happened even more quickly. This last stage was around 12,000 years ago (the end of the last Ice Age), though the Cascades have been forming for 15 million years. As for the road itself, it was built between 1913 and 1922. It's not the most direct, so in time it was replaced with Interstate 84. Though the interstate is beautiful, don't use it unless you're trying to get somewhere. The Historic Columbia River Highway No. 100 is the technical name, and that's the one you want. If this area sounds familiar and you've never been, you probably remember it from The Oregon Trail (yes, that Oregon Trail, because obviously). It was one of the most difficult, expensive, and dangerous parts of the trek, and caulking a wagon and floating it with a herd of oxen in tow and Sally with dysentery couldn't've been easy. A wagon road wasn't built through the gorge until the 1870s. Yeah. But wouldn't you get there and just want to stay, anyway?